At 53, Pete Dizinoff feels like he has built a successful life for himself: successful marriage, great friends, a respected physician practice and all the trappings. But when he sees his only son, Alec, veer off the path Pete hopes for him, Pete’s desperation to “save his son” devastates his whole life. To be honest, Pete reminded me a bit of Neil Perry’s father in Dead Poets Society (you know, the mean man who wouldn’t let Sean Robert Leonard pursue his dream of acting), and that made it very difficult for me to sympathize with him at all. He actually thinks things like if his son doesn’t graduate from college, he won’t be able to look people in the eye anymore because they will give him looks of pity. Ummm…ok. The novel is actually set up in such a way that we start by knowing Pete has done some horrible thing which has distanced him from his wife, son and longstanding best friends Joe and Iris. And we suspect it has something to do with Joe and Iris’ oldest daughter Laura, who has come back to town after more than a decade away and begins a relationship with Alec. Laura, by the way, is by far the character with the most intriguing story – at 17 she gave birth to a premature baby in the library bathroom and smashed in its skull – but unfortunately her motivation is never explored in any real depth which makes her seem more like a plot point than a real person. In any case, due to this narrative structure, you are compelled to read on to find out what Pete could’ve done that was so terrible he even lost his practice. Grodstein is a great writer – scenes flowed, sentences impressed, the story engaged – but I was a bit disappointed in the big showdown at the end where we finally find out what Pete did to fall from grace. The revelation was frankly disproportionate to the amount of pages it takes to get there. Where it does excel is as a portrait of a middle-aged man trying to come to terms with life and death and contemplating his own legacy. So if you enjoy in-depth character studies of not-so sympathetic men as they grapple with family dynamics, this one is a real winner. 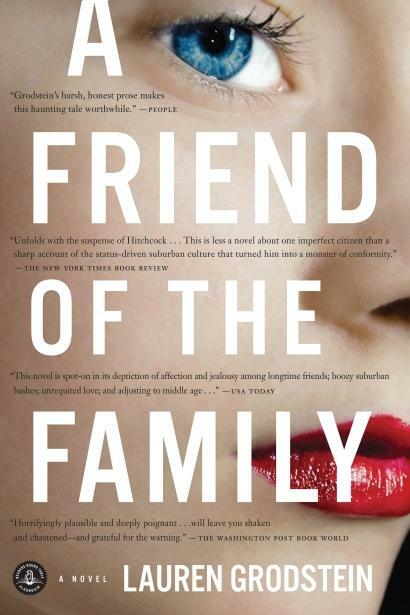 A FRIEND OF THE FAMILY is available now in hardcover (the book jacket featured is from the paperback which will come out in November 2010). Find out more about it at the author’s website. My eyes bulged out of my head with the baby skull thingy...I'm in the mood to read a story with a sympathetic male figure...I'm not sure this is for me. The baby skull thing is kind of freaking me out too. I'm wondering now if the big secret of the mc has anything to do with the pregancy. This one sounds riveting. I just reserved it at my library! Sounds interesting, but I hate being built up just to be let down. Probably not my kind of book, but what a stunning cover. I can't stand it when there's a big build up for what you think is a huge secret and then it's like - ho-hum, that's it? Thanks for the recommendation though I'm not sure this is a book for me. Pete sounds like quite a piece of work! I do like character studies, and sometimes enjoy a less than likable character, so I might have to consider this book. Thanks for the great review, Lenore. Love that striking paperback cover -- the blue eye, the red lipstick. Very memorable. But the story? Definitely sounds a little creepy... and I'm with everyone else: the whole baby-skull issue seems a little much. I've had bad luck with books "hyping" up a certain plot point or mystery for most of the book, too, only to be let down when the revelations finally came. Not sure if this one is for me! The baby skull thing is a bit freaky to read like this, but "in-depth character studies of not-so sympathetic men as they grapple with family dynamics" are the kind of things that fascinate me. I'm adding this to my wishlist! The premise is certainly interesting. It's too bad the big reveal was a bit of a let down in the end. I admit to being curious about this one though, especially given how character driven the novel is. Thank you for your great review, Lenore. This is a book that I'll probably skip. I hate it when books build you up then just let you down. It makes me feel like I worked so hard to get to the end of the book for nothing. And the girl character sounds really interesting, it's a shame she's not explored more. I love books that have really well developed periphery characters that help you make sense of some of the main characters - I feel like it just leads to a fuller story.